The above info came from Who Wants to Know?, and was edited by yours truly (contact me). The image came from Gundam Plus Screenshots. Terry Sanders, Jr. Terry Sanders, Jr. 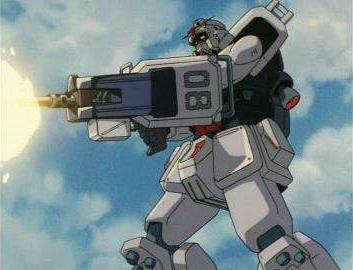 It's UC0079: right in the middle of the One Year War between the Federation and the Duchy of Zeon. The story begins with a group of Federation soldiers: most of them young and naive, full of vision and resolve. They have yet to realize that they are about to join probably the most notorious battle group in history: The 08th Mobile Suit Team. With only a few guerillas for allies, they are to seek out and drive away a powerful Zeon force that has dug in the jungles and hills of southeast Asia. A side story in the universe of Mobile Suit Gundam , this isn't about politics or about the greater victory in the war. It isn't about "Newtypes" or high-tech state-of-the-art mobile suits. It's less about the machines and more about the people within their metal skins. This is the story of the microcosm that is life on the front lines, where "Zeeks" and "Feddies" go toe-to-toe, machine-to-machine in cities, jungles, and hills. This is the story of men and women who have lives back home yet put those same lives on the line in defense of their home and their beliefs. This is the story of just how important the relationship between two people can be and how such human bonds can cross even such hated enemy lines as these. NOTE: Of interest is that despite its relatively short length, the story of the 08th MS Team was actually written out over the span of three years: the longest of any Gundam series. Veteran director Takeyuki Kanda actually passed away early in the production.